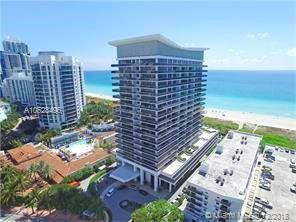 Very bright 2 Bedroom and 2.5 Bathroom residence with ocean views from all rooms. MEI is a modern boutique building with just 140 units and resort like amenities including: beach and pool service, concierge, library, valet, bike storage, gym, spa, yoga room and more. This residence features white porcelain floors, floor to ceiling windows and top of the line appliances. Located at Millionaire row with tranquil and wide sand beaches. Cable and internet are included.